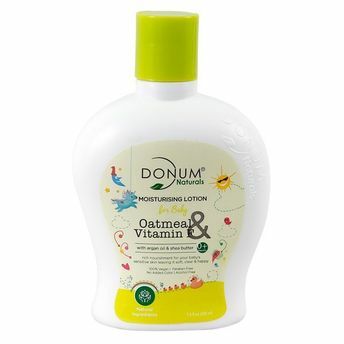 Donum Naturals Oatmeal & Vitamin F Moisturizing Baby Lotion is enriched with unique natural ingredients, which helps to hydrate your baby's sensitive skin, without causing any irritation. Argan oil being non-greasy is quickly absorbed helping to protect your baby's skin from head to toe. Vitamin F nourishes skin cells whereas Shea Butter contains anti-bacterial compounds, which helps to resolve, soothe and clear up skin irritations. This unique blend is loaded with skin nutrients which are ideal for a happy and healthy skin of your little one.